DAN-JOE & MALCOLM (WW1) - Chapter 12, "Winter In The Trenches (1916-1917)"
Ch. 12 - "Winter In The Trenches (1916-1917)"
The operational order of the 26th is dated October 9th and reads: "The Battalion will move from its present Billetting Area tomorrow October 10th to Longuevillette (from Berteaucourt) moving into First Army area. ... Route includes Canaples, Montrelet." By the 14th, it appears that the battalion arrived at their destination. Further orders read: "The 2nd Canadian Division has been ordered to relieve the 37th Division in the line from Souchez to Houele Crassier ... relief to be completed by morning October 18th. ... The 26th Battalion will relieve the 8th Battalion East Lancashire Regt which holds the left sub sector of the front line Bully Alley exclusive to trench No 210 inclusive." The return to the trenches, at least for Dan-Joe, did not go well. There would not appear from the larger record that there was no unusual activities in the trenches as the Canadian soldiers replaced the British. But it was a set up which brought home to D. J. the miseries he went through just before he left the Somme and the time of his younger brother's, death. On October, 29th, Dan-Joe was "Admitted to 4 Field Ambulance Depot for 'Shell Shock.'" It will be remembered that, but a month before, two days after the death of Malcolm, Dan-Joe had spent five days in a field hospital for Shell Shock, then joined the march to a new part of the front. 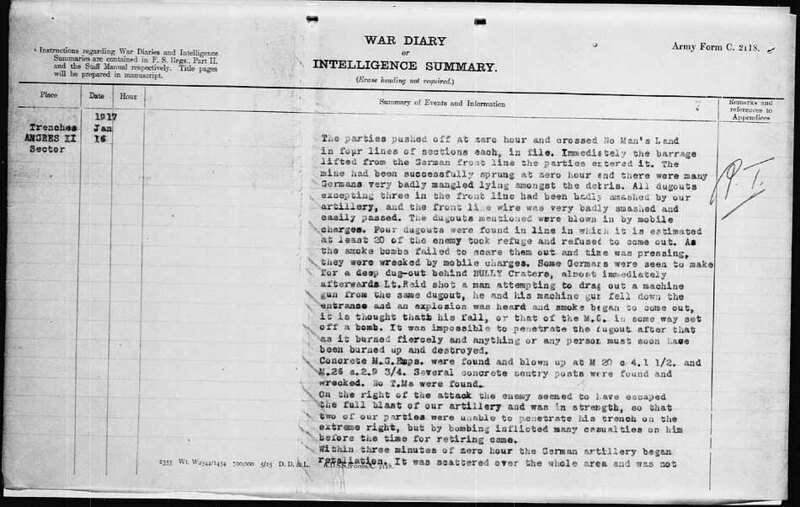 Further from his medical records we see that on November 7th he was at "Div Rest Station"; then, on the 16th, he is brought in again by the "No 4 Can F'd Amb." Beyond this date there is nothing in Dan-Joe's record, so we might imagine that Dan-Joe's medical condition settled down. We will pickup his individual experiences when the Allies go on the offensive in the spring of 1917. In the meantime, we resort to the general record for the activities of his battalion through the winter of 1916-17. During November the military leaders, who had been addressing the Gas problem, issued respirators. On November 4th we see where the 26th were issued "503 new box respirators at Brigade Gas Hut, each man fitted, remain in hut approximately 3 minutes in strong Tear Gas. Furnished all available men for Bde. Working Parties." On Sunday, on November 5th, then being in a rest area "Divine Services held A.M. in Y.M.C.A. Hall, Bully Grenay." On the 8th the battalion move to relieve other in the trenches. "We found trenches in precarious state and all ranks bend their energies for their upkeep. Weather fair, conditions quiet." On the 14th, they came out of the trenches to "Bde. Reserve Posse 10." This camp was in the Arras/Lens area, I believe a small mining village to the west of Lens, Sains-en-Gohelle.60 These men of the 26th then, while in camp, were congratulated through their CO from HQ.61 It was recognised "that a large amount of work was carried out by your Battalion and that they left the trenches in a far better state than they have ever been in since we took over the sector." While at camp: "Bathing parades held as per bath schedule. Musketry practices carried on Brigade Range." So too, there is an observation of the increasing presence of aircraft. "Our aeroplanes patrolled flying over quite low and were fired on by M.G. A.A.G. between 2pm and 4pm. No [German] planes or balloons seen." On the 19th, gum boots were issued "to be obtained at Gum Boot Store" to replace the old gum boots which will be sent to be dried out. On Nov. 25th there is a note: "All boots must be turned in." On the 20th they were back in the trenches. Two days later the 26th pulls off a successful raid on a German trench. For the raid plan, see: first page & second page. On the 26th the battalion moved back to "Bde. Support." In December of 1916, for Dan-Joe's battalion, events were much like November. At intervals (around eight days), the men were circulated back and forth from the trenches to the rest ares some distance in behind. On the 3rd, we read: "Situation very quiet. Men cheery. Every available man working on front and support lines also pushing work of wiring the front. Transport as usual on time every evening and rations appreciably good." In the trenches in was colder and only the occasional exchange of mortar fire; the troops continued with their trench work, including running wire. When back in camp the men were rested and the men had regular bath parades, drills, training and inspections. And concerts: the 11th of December: "All ranks very comfortable in these billets and concerts were arranged in Church Army Huts for recreation and amusement of the men. "62 On the 14th the battalion was moved to the trenches to relieve another: turnabout. 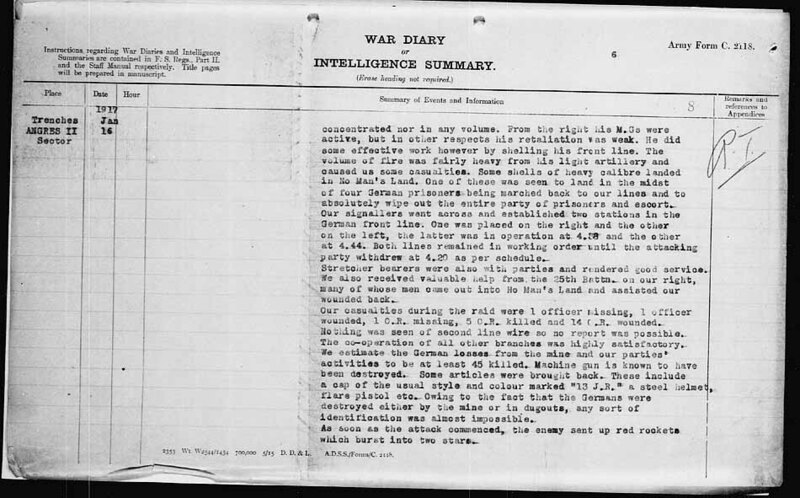 We see from the War Diary the entry for the 14th that a code word was given, "Duck." The departing battalion was instructed to leave all supplies behind, with the "relieving battalion to give receipts. 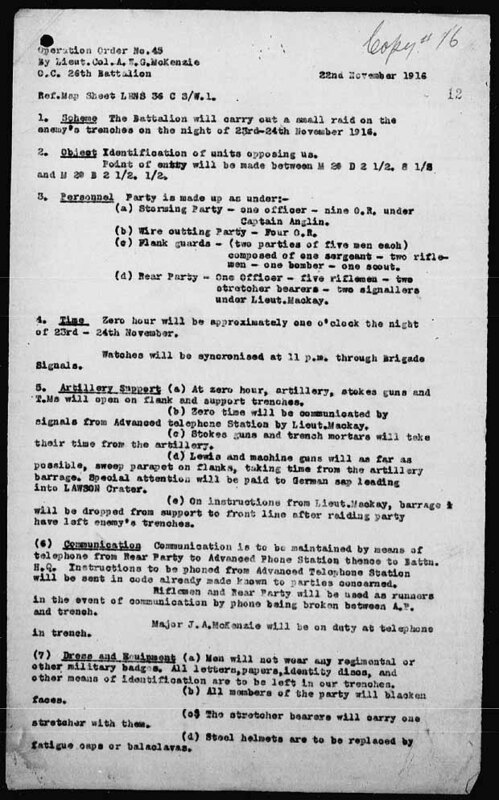 Reports to go the HQ with supplies for which receipts were given, and to give report re condition of trench." It was not unusual in the dark of night for scouting parties to be sent out over "No Man's Land." The Germans did likewise. At times both sides would run into one another; but while a bomb or two might be hurled and shots made, usually it did not lead to causalities; and the parties sought the safety of their respective trenches. Christmas came.63 If you were lucky enough to be in camp64, as was Dan-Joe's battalion, then on Christmas Eve, "Divine Services held at 10 and 11 a.m. in YMCA and Church." On Christmas Day, "working parties cancelled." On the 25th, the camp became quite active with many "visitors from Staff and sister Corps called and all ranks had a Merry Christmas." Indeed, in the Diary, we see just after Christmas: "The efficiency and excellent management of our Quartermaster's Department is here commended upon and congratulations extended to [the] Quartermaster." The merriment of Christmas was soon extinguished by the reality of the trenches, when, on the 27th, Dan-Joe's battalion was sent to the trenches and found to be "in bad shape from recent very wet weather and strafing." And, so, we have arrived at January, 1917; half way through the six month period under review. The festive season seemed to have extended to at least January 3rd. Then Dan-Joe was with his battalion, who were at "Bde. Reserve in POSSE 10. Rested for day. Arrangements for Holiday treat for all companies ... in Church Army Hut." Practice, they say makes perfect and army leaders are well aware of that: On the 4th, "At the baths Companies. Practiced the attack for coming operation (preliminary)"; 5th, Practice "in attack 3 waves." 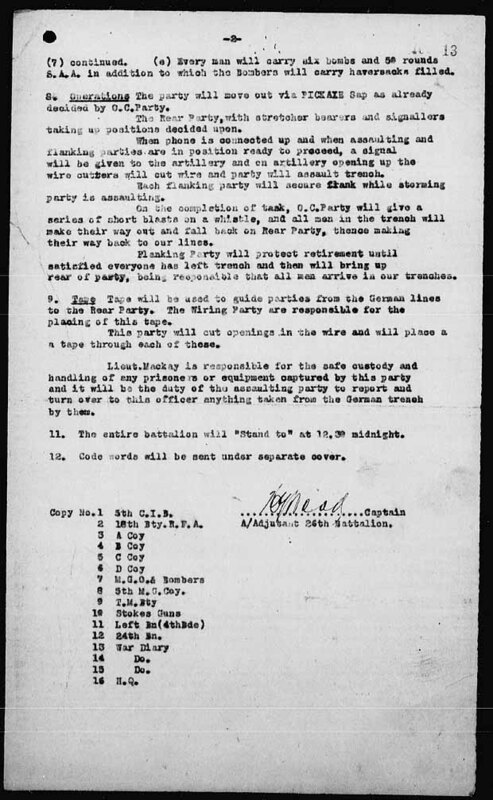 On the 6th, "Marched to tape trenches ... reconnoitred and practiced by parties preliminary for coming operation. ... Company Dinner held." On the 8th, Practice continues. Then on the 9th: To the tranches. "... situation quite active. Artillery of all calibres busy cutting wire as well as T.Ms [Trench Mortar] opposite Thompson & Bully Craters." From all indications this was yet another successful assault by the Canadians.65 Next day, they were back to trench life. Weather cold with light fall of snow. Within ten days, we find Dan-Joe and his fellows at the rest camp behind the lines. Training continued, including, "Musketry, Drill and lecture." That Sunday, Church Parade. Also, Bathing Parade. And so, February passed in much the same way as January. February can be summed up by turning to the "Diary." 05, "Battalion in training. Weather fine and cold. Training as follows: Company in Attack morning - Box Respirator Drill &c. Evening - Brigade gave Dinner to Battalion Commanders. ..."
08, "... Evening:- Lecture to all officers attending by Divisional Commander. Lecture on 'Principle for which we are fighting' by Lt.Col. Blackburn, Senior Chaplain." 12, "The battalion held a muster parade and later cleaned up its billeting area. Orders were received to march on the following day to Bois des Alleux in the Vimy reserve area." 13, "... Battalion marched to Bois des Alleux a distance of about 12 miles ... Battalion now in Divisional Reserve - hutments. 16, "... Baths at Ecoivres. At 5:15 a.m. Hun plane dropped 3 bombs on Ecoivres near transport lines killing 2 civilians, No military damage done." 19, " ... Moved to trenches ... Night very dark. Trenches very wet. ... Night passed very quiet. No shelling. ...."
A quick look at March of 1917, as is reflected in the "Diary." At the first of this month the battalion was "in Brigade Reserve. On March 3rd an interesting event happened on the front where the 26th Battalion was stationed. A bit of an armistice was agreed to, directly, between the Canadians in the trenches and the Germans opposite. It seemed to be a spontaneous thing, HQ did not arrange it, nor knew of it until next day. Which trench officers arranged for it, and exactly when is not something that is to be determined. What we know from the "Diary" is that "about 10:30 a.m. 3 German officers with a Red Cross Flag walked across No Man's Land. Soon there was to be quite a crowd of both Germans and Canadians. They were out retrieving the dead. "The agreement was that the Huns would carry our dead half way and our men would take them back to our own lines. This armistice lasted until 12 noon. ... A German Brigadier was conducting these operations and seemed most anxious to converse with any of the officers. He mentioned he was educated at London. Judging by appearances one would come to the conclusion that the regiment of Huns employed on this special occasion were selected for the express purpose of being on show for our benefit in that the officers and men were of exceptionally good physique, looked well fed, and very clean."